1Universidad Nacional de Colombia-Sede Medellín, Facultad de Ciencias, Calle 59a 63-020 Autopista Norte, AA 3840, Medellín, Colombia. "Corresponding author (dldurango@unal.edu.co). 2Universidad Nacional de Colombia-Sede Medellín, Facultad de Ciencias Agropecuarias, Calle 64 x Carrera 65 Autopista Norte, AA 1779, Medellín, Colombia. The growth of fungi during pre - and postharvest of fruits may cause spoilage and result in a reduction in quality and quantity. The aim of the present work was to investigate the efficacy of four extracts (n-hexane, dichlorometane, ethyl acetate, and methanol) and the essential oil of Piper auritum Kunth and P. holtonii C. DC. on the growth inhibition of three important postharvest pathogens of fruits (Colletotrichum acutatum, C. gloeosporioides, and Botryodiplodia theobromae). The in vitro antifungal activity was assayed following the poisoned food technique. The results showed that both n-hexane extract (HE) as essential oil (EO) displayed a relative good control against the three pathogens, being the originating materials of P. holtonii the most actives. 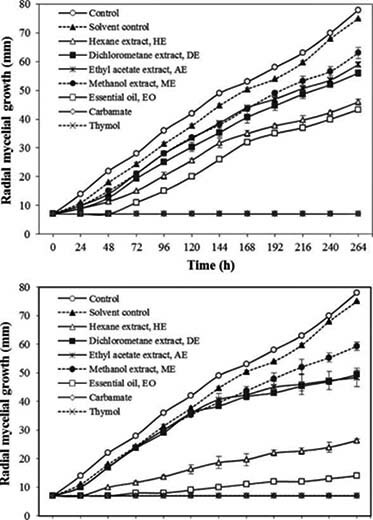 Mycelial growth of C. acutatum, C. gloeosporioides, and B. theobromae was significantly inhibited at 400 μg mL-1. Additionally, the chemical composition of the bioactive materials was analyzed by gas chromatography-mass spectrometry (GC-MS). Safrole (64.54/56.88%) and apiol (64.24/57.20%) were the major constituents of the EO/HE from P. auritum and P. holtonii respectively. Structural identification was also confirmed by nuclear magnetic resonance. Both compounds exhibited significant antifungal properties. It can be concluded that EOs/HEs from P. auritum and P. holtonii, and their major constituents, have interesting applications to control plant pathogenic fungi. Key words: Piperaceae, essential oil, apiol, Colletotrichum, Botryodiplodia. El crecimiento de hongos durante pre- y poscosecha de frutas puede causar el deterioro y resultar en una reduccion en la calidad y cantidad. El objetivo del presente trabajo fue investigar la eficiencia de cuatro extractos (n-hexano, diclorometano, acetato de etilo, y metanol) y el aceite esencial de Piperauritum Kunth y P. holtonii C. DC. en la inhibición del crecimiento de tres importantes patogenos de pre- y poscosecha de frutas (Colletotrichum acutatum, C. gloeosporioides y Botryodiplodia theobromae). La actividad antifúngica in vitro se evaluó siguiendo la técnica del alimento envenenado. Los resultados mostraron que tanto el extracto en n-hexano (HE) como el aceite esencial (EO) exhibieron un relativo buen control contra ambos patógenos, siendo los materiales provenientes de P. holtonii los más activos. El crecimiento micelial de C. acutatum, C. gloeosporioides y B. theobromae se inhibió significativamente a 400 μg mL-1. Adicionalmente, se analizó la composición química de los materiales bioactivos mediante cromatografía de gases-espectrometría de masas (CG-EM). Safrol (64.54/56.88%) y apiol (64.24/57.20%) fueron los componentes mayoritarios del EO/FE para P. auritum y P. holtonii, respectivamente. La identificación estructural fue adicionalmente confirmada por resonancia magnética nuclear de 1H. Ambos compuestos exhibieron propiedades antifúngicas significativas. Se puede concluir que EOs/ FEs de P. auritum y P. holtonii, y sus componentes mayoritarios tienen interesantes aplicaciones para el control de hongos patogénicos de plantas. Palabras clave: Piperacea, aceite esencial, apiol, Colletotrichum, Botryodiplodia. Stem-end rot (causal agent Botryodiplodia theobromae) and anthracnose (causal agent Colletotrichum acutatum and C. gloeosporioides) are two serious diseases that contribute significantly to pre-and postharvest loss of economically important fruits around the world (Verma and Sharma, 1999). These three pathogens have been reported to attack a wide range of hosts including tamarillo (Solanum betaceum Cav. ), avocado (Persea americana Mill. ), mango (Mangifera indica L.), papaya (Carica papaya L.), citrus, apple (Malus domestica Borkh. ), and peach (Prunus persica L.), among others. The primary method of control of both diseases involves the use of synthetic fungicides (Eckert and Ogawa, 1985). The pre- and postharvest treatments with Cu, dithiocarbamates, benzimidazole, and triazole compounds has been highly effective for controlling of these postharvest diseases in various fruits. However, effectiveness of chemical treatment has been decreasing in recent years due to the development of tolerance by C. acutatum, C. gloeosporioides, and B. theobromae (Gutiérrez et al., 2003). As a result, it has been necessary to increase the quantities of these compounds that have to be used in the agriculture, with the consequent additional problems of residue persistence, and serious economic damage arising from the decreased quality of fruits (Tripathi and Dubey, 2004). Therefore, public opinion and fruit industry urgently demand new alternatives to combat major postharvest decays that are free of synthetic fungicides (Sharma and Pongener, 2010). In such way, the use of essential oils, plant extracts, and some of their constituents can be a very attractive method for pre- and postharvest disease control of fruits, due of their relatively safe status and wide acceptance by consumers (Ormancey et al., 2001). Thus, the aim of the current work was to screen the antifungal activity of extracts and essential oils from Piper auritum and P. holtonii, and their major constituents, against the fungi C. acutatum, C. gloeosporioides, and B. theobromae. In addition, for bioactive materials, chemical composition using gas chromatography-mass spectrometry (GC-MS), along with the toxicity on fruit peel, were evaluated. Colletotrichum acutatum, C. gloeosporioides, and B. theobromae were respectively isolated from infected tamarillo, papaya, and avocado fruits. Fungi were characterized and kindly provided by the Laboratory of Phytopathology (Universidad Nacional de Colombia, Medellín). To evaluate the antifungal activity, previously sterile Petri dishes measuring 9 cm in diameter were inoculated with 1 mL of a spore suspension of the fungus and incubated at 25 °C for 48 h. Mycelial disc of 7 mm of diameter was used for antifungal test. The plant material of P. auritum and P. holtonii were collected at the Campus of Universidad Nacional de Colombia, Medellín (6°15' N, 75°34' W), in October 2010, and identified by Dr. R. Callejas, Universidad of Antioquia, Colombia. Voucher specimens (P. holtonii, catalogue number 407594, number of collection 06355; P. auritum, catalogue number 494711, number of collection 569) were deposited at the Herbarium "Gabriel Gutiérrez V"-Medel of the Universidad Nacional de Colombia (Medellín). The fresh aerial part (900 g) of P. auritum and P. holtonii were submitted to hydrodistillation for 3 h. The distilled was extracted using ethyl acetate (EtOAc), dried over anhydrous sodium sulfate, and the solvent evaporated. The essential oils (EOs) were preserved in sealed vials at 4 °C until further analysis. Fresh plant aerial material (900 g) of P. auritum and P. holtonii were extracted with different solvents in increasing order of polarity, by percolation at room temperature during 1 wk, to obtain hexanic (HE), dichlorometane (DE), ethyl acetate (AE), and methanol (ME) extracts. Then, extracts were dried, the solvents evaporated, and stored in sealed vials at 4 °C until further analysis. where C and T are the radial growth (mm) of fungus in control and treated plates, respectively. In addition, for bioactive materials and their major constituents, the concentration that inhibits 50% fungal mycelial growth (IC50) was preliminary determined for C. acutatum and B. theobromae (Rivillas-Acevedo and Soriano-García, 2007). Extracts and/or essential oils that show a promissory antifungal activity were tested for their phytotoxicity on the avocado (var. Lorena) and tamarillo (var. Naranja) peel. Mature fruits were washed with tap water, air-dried at room temperature (23-25 °C) and its surface permeated with the treatment solution, using a fine brush. Phytotoxicity has been defined as the extent of the apparent burning damages (discoloration) induced at 1% (Khewkhom and Shangchote, 2009). Therefore, bioactive materials were dissolved in ethanol to reach that concentration. Control treatments consisted of fruits treated with sterile distilled water (control) and EtOH (solvent control). Further, fruits were stored in plastic baskets at room temperature for 8 d, and every 24 h a new application was made. Phytotoxicity was evaluated visually using a scale indicating the extent of surface on which color changes (discoloration, necrosis) are observed (Amiri et al., 2008). Assays were performed in triplicate for each treatment. The in vivo assay was made as described previously by Garcia et al. (2008) with some modifications. Briefly, papaya fruits (cv. Hawaiian) free from defects were washed, disinfected with sodium hypochlorite solution (0.05%), rinsed with distilled water, and air-dried. Then, fruits were wounded with a sterile nail in the equatorial zone and inoculated with a micelyal mass of C. gloeosporioides. After 12 h, fruits were sprayed with 2% of extract, EO, or compound that showed a promissory antifungal activity. Fruits were stored in plastic baskets at room temperature (24 ± 2 °C), and the incidence of infected wounds evaluated after 7 d. All experiments were performed with five replicates per treatment and untreated fruits were used as controls. The GC-MS analysis of the bioactive materials was performed using a Hewlett-Packard 6890 (Agilent Technologies, Palo Alto, California, USA) equipped with a HP 5973 MSD (Mass selective detector-Quadrupole type) detector and ZB-35 column (Phenomenex, length: 30 m, film thickness: 0.25 μm, column ID: 0.25 mm). Chromatographic conditions were as follows: the oven temperature was programmed from 50 to 300 °C at 5 °C min-1, and then held isothermally for 10 min; injector temperature, 175 °C; detector temperature, 250 °C; carrier gas was helium (constant flow at 1.0 mL min-1) and the average gas velocity was 36 cm s-1. Samples of 3 pL were injected in the splitless mode. Electron impact mass spectra were obtained at 70 eV of electron energy, and monitored from mass to charge ratio (m/z) 30 to 400. The ion source and quadrupole analyzer temperatures were fixed at 230 and 150 °C, respectively. Relative composition of the individual constituents was determined from the peaks area relative to the total peak area. Bioactive materials were subjected to column chromatography with silica gel 60 (0.063-0.200 mm, Merck) and eluted with n-hexane:EtOAc mixtures of increasing polarity to yield six fractions. Fractions 2 and 3 (n-hexane:EtOAc; 9:1 and 8:2) were purified by preparative thin-layer chromatography (TLC, Si 60 F254, 0.25 mm, Merck) (n-hexane: EtOAc; 9:1) to yield two major compounds, safrole (from P. auritum) and apiol (from P. holtonii). The molecular structures of these compounds were identified by MS, 1H and 13C Nuclear magnetic resonance (NMR) analysis, and comparison with the NIST 2002 computerized mass spectral library. NMR spectra were recorded in deuterated chloroform (CDO3) on an AMX 300 NMR spectrometer (Bruker, Germany, 1H NMR, 300.12 MHz; 13C NMR, 75.42 MHz). Chemical shifts, δ, were expressed in ppm units downfield from tetramethylsilane and coupling constant J in hertz (Hz). 2D experiments (JMOD, 1H-1H COSY, HMQC and HMBC) were carried out for structure determination. Essential oils and extracts yields of fresh aerial parts of P. auritum and P. holtonii are shown in Table 1. In general, yields of EO and extracts of P. holtonii were higher than those of P. auritum. Furthermore, the DE of both Piper species showed the highest yield (0.45 and 0.53% for P. auritum and P. holtonii, respectively). However, the percentage of EO from P. auritum was lower than those reported for leaves (2.3%) and inflorescences (2.4%) using microwave-assisted hydrodistillation and a Clevenger apparatus. Table 1. Yields of essential oils and extracts for the aerial parts of Piper species. aCrude weight results from 900 g of fresh aerial parts. bYield (%) = (crude weight/900 g)x100. The inhibitory effects of EO and organic extracts of P. auritum and P. holtonii on the growth of C. acutatum, C. gloeosporioides, and B. theobromae are presented in Figures 1, 2 and 3. In general, the growth of fungal mycelium depends on the EO and extract in the culture medium, and the tested Piper species. The EO and HE of both Piper species exhibited moderate to high antifungal activity against all the tested fungi. At 400 μg mL-1, EO and HE of P. auritum inhibited the radial growth of C. acutatum completely during the first 48 h. Then, growth inhibition descended to reach 40% after 264 h. Even at 100 μg mL-1, inhibition percentages of C. acutatum ranged from 87 (between 24 and 48 h) to 20% (from 192 to 264 h) for both treatments (data not shown). For P. holtonii, EO and HE exhibited the strongest antifungal activity. In fact, fungal colony development initiated only after 96 and 144 h when C. acutatum was treated respectively with HE and EO at 400 μg mL-1. 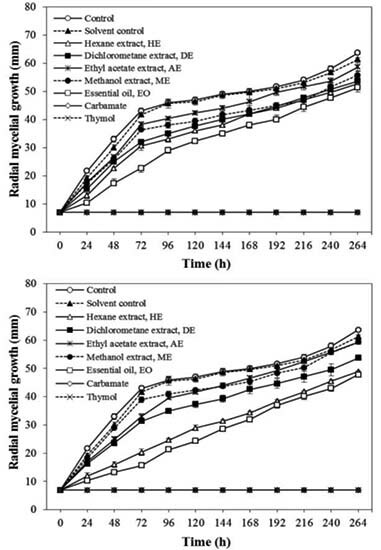 Indeed, growth inhibitions were even higher than those reached by P. auritum, ranging from 100 to 90% (after 264 h) for EO, and 100 to 80% (after 264 h) for HE, at 400 μg mL-1. A similar behavior of extracts and EOs against C. gloeosporioides was observed. Essential oil exhibited the highest antifungal activity against this fungus followed by HE. Additionally, P. holtonii displayed a mycelial growth inhibition higher than P. auritum. In the case of B. theobromae, EO of both Piper species also exhibited the highest mycelial growth inhibitions, followed by HE. During the first 72 h, the fungus was completely inhibited by EO from P. auritum. Overall, EO of P. holtonii appeared to possess the strongest antifungal activity; it inhibited 100% the fungal growth of B. theobromae during 96 h. On the other hand, HE from P. holtonii showed a moderated effect against B. theobromae, causing growth inhibitions between 80 and 60% after 96 h. As can be seen, ME, AE, and DE showed a weak antifungal activity against all the tested fungi. Thymol and carbendazim presented a significantly higher antifungal effect than all evaluated extracts. Carbendazim is commonly used for control anthracnose disease both in the field and postharvest. However, some plant pathogens, such as C. acutatum and C. gloeosporioides possess resistant strains to carbendazim (Zhang and Huang, 2007). Meanwhile, thymol has been recognized for its potent antifungal activity (Numpaque et al., 2011). Figure 1. Effect of extracts and essential oil of Piper auritum (up) and P holtonii (down) at 400 μg mL-1 on radial mycelial growth of Colletotrichum acutatum. Results are shown as medium values of three replicates of mycelium diameter; bar = ± SD. Figure 2. 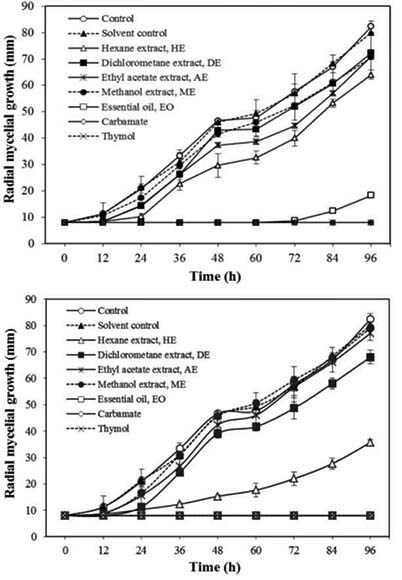 Effect of extracts and essential oil of Piper auritum (up) and P. holtonii (down) at 400 μg mL-1 on radial mycelial growth of Botryodiplodia theobromae. Results are shown as medium values of three replicates of mycelium diameter; bar = ± SD. Figure 3. Effect of extracts and essential oil of Piper auritum (up) and P. holtonii (down) at 400 μg mL-1 on radial mycelial growth of Colletotrichum gloeosporioides. Results are shown as medium values of three replicates of micelium diameter; bar = ± SD. The chemical composition of EOs and HEs from fresh aerial parts of P. auritum and P. holtonii was analyzed by means of GC-MS. The detected constituents (relative amounts higher than 0.1%) are shown in Table 2. Analysis by GC-MS led to the identification and quantification of about 50 components, among them 26 in P. auritum and 38 in P. holtonii, comprising between 82-100% of the total composition of the EOs/HEs. Phenylpropenes were the main components detected in EOs and HEs for both species, being safrole (69.54 and 56.88% in EO and HE) and apiol (64.24 and 57.20% in EO and HE) the major constituents on P. auritum and P. holtonii, respectively. The phenylpropenes eugenol, myristicin, isosafrole, elemicin, and asarone were also found in low proportion. The presence of safrole in EO of P. auritum as major compound is consistent with some previous reports (Gupta et al., 1985). Nevertheless, there are differences regarding the amount of safrole found in P. auritum (Sánchez et al, 2009). According to Castañeta et al. (2007), the EO obtained by hydrodistillation from aerial parts of P. auritum presented among 64.0 and 91.4% of safrole. It is well known, however, that the variability on proportion of each component and composition of EO depends on several parameters including geographical origin, vegetative stage of plant, storage condition and extraction method, among others (Chatzopoulou and Katsiotis, 1995). Table 2. Chemical composition of the essential oils (EOs) and hexanic extracts (HEs) from Piper auritum and P. holtonii. -No detected. tRetention times (Rt) in minutes. ttMolecular and fragment ions (m/z) were determined by mass spectrometry, electronic ion ionization at 70 eV, total ion monitoring was done in a scan mass range from 30-400 m/z, and match comparison with the NIST-MS library. tttOptical rotations were measured in CHCb solution at 20 °C with a JASCO P-2000 digital polarimeter. Minor components such as monoterpenes and sesquiterpenes were also detected. In the EO and HE of P. auritum the proportion of monoterpenes was respectively 8.39 and 15.69%, mainly related to cyclic monoterpenes (p-cymene, γ-terpinene, terpinolene, α-terpinene, and camphor). Some of these components possess antifungal and synergistic properties (Rattanachaikunsopon and Phumkhachorn, 2010); furthermore, several studies have shown that monoterpenes cause damage to the microbial cell membrane (Cristani et al., 2007). For P. holtonii, however, monoterpenes were not detected. Instead, several sesquiterpenes were found in oil (12.47%) and extract (10.79%). Piper holtonii showed the presence of acyclic (t-nerolidol), monocyclic (humulene), bicyclic (β-caryophyllene and their oxide), and tricyclic (α-copaene, β-bourbonene, among others) sesquiterpenes. Several fatty acids and their esters, rose ketones (α-ionone, 3-oxo-α-ionol, 3-hydroxi-β-damascone), and other minor components were classified as "others" comprising between 0-3% and 10-23% of the total composition of EOs and HEs respectively. To the best of our knowledge, this is the first report of the EO/HE composition and antifungal activity of P. holtonii. However, some earlier papers have reported cytotoxic, leishmanicidal, and antimalarial activity of extracts and fractions of P. holtonii and the isolation of 5-(3',4'-methylenedioxyphenyl)-2E,4E-pentadienoic acid isobutyl amide (Garavito et al., 2006; Correa et al, 2010; Sánchez-Suárez et al, 2010). Overall, HEs from P. auritum and P. holtonii were more effective against plant pathogenic fungi than DEs, AEs, and MEs, indicating that the potential fungitoxic compounds were present in the low-polarity extracts. These fractions (HEs) possess as major components the phenylpropenes, being the most abundant safrole and apiol. Similarly, EOs have a high proportion of phenylpropenes and show a relatively good antifungal activity against the assayed microorganisms. 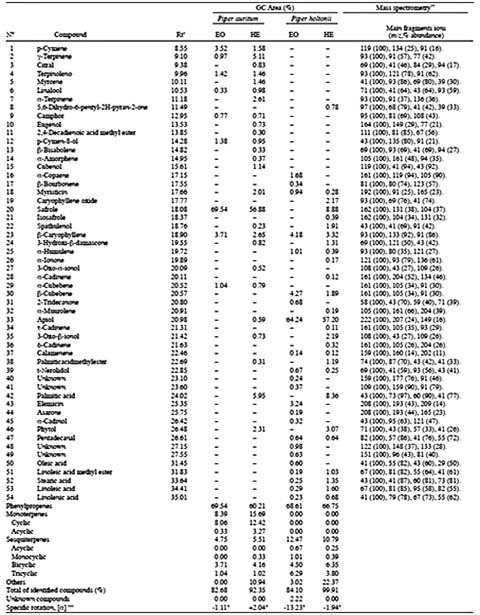 For these EOs the observed IC50 values were minor in all the assayed microorganisms (Table 3). These results indicate that the antifungal activity of HEs/EOs could be associated to the presence and amount of the phenylpropenes. Safrole has been found in other plants and is the major component of the EO of Sassafras albidum (Lauraceae), which has shown antifungal activity (Simic et al., 2004). Meanwhile, apiol is present at high concentration (40 mg g-1 dry seed) in seeds of Ligusticum hultenii. It has shown to possess antifungal properties (Meepagala et al., 2005). On the other hand, it is also possible that some minor components might be involved in some synergistic and/or antagonistic interactions with other active compounds (Gould, 1996). It is noteworthy that although the proportion of safrole and apiol in all materials was close, FE and EO from P. holtonii were the most active against C. acutatum, C. gloeosporioides, and B. theobromae than that from P. auritum. This activity can be associated with the kind of phenylpropene presents in the EO/FE. Thus, some structural requirement could be involved in the antifungal activity. Table 3. Mean inhibitory concentrations (IC50) of hexanic extracts (HEs), essential oils (EOs), safrole, and apiol against Botryodiplodia theobromae and Colletotrichum acutatum. In view of the results presented by EOs and FEs from P. auritum and P. holtonii, these were selected for a phytochemical study. Bioactive materials (EOs and FEs) were subjected to column chromatography on silica gel leading to isolation of safrole and apiol. Their structures were confirmed by NMR data, including bidimensional analysis and comparison with spectroscopy data reported in the literature (Benevides et al., 1999; Chu et al., 2011). The interpretation of bidimensional spectra indicated that compound obtained from P. holtonii corresponds to isomer 2,3-dimethoxy-4,5-methylenedioxy-1-allylbenzene. According to the results given in Table 3, both compounds displayed significant antifungal activity. Fowever, apiol was found to be more effective against both fungi as compared to safrole. Apiol exhibited a potent antifungal activity against C. acutatum and B. theobromae with IC50 values < 50 μg mL-1, being 36.2 μg mL-1 for the first. These results are in agreement with previous investigations in which it has been demonstrated that apiol possesses antifungal activity against some agriculturally important fungi (Meepagala et al., 2005). Furthermore, IC50 values for apiol are lower than those of their corresponding FE and EO. These results demonstrate that is possible to think the antifungal effect of FE/EO of P. holtonii is mainly due to the presence of apiol. On the other hand, although safrole exhibited a moderated activity against C. acutatum, the IC50 value (349.5 μg mL-1) was lower than those found for FE or EO. Thus, the antifungal properties of FE/EO from P. auritum against C. acutatum are believed to be associated with the presence of safrole. Remarkably, however, the IC50 value for safrole (891.2 μg mL-1) against B. theobromae was higher than those of their corresponding HE/EO (749.0 and 475.7 μg mL-1). It suggests that the effectiveness of FE/EO from P. auritum against this pathogen could be due to some other minor constituents or synergistic interactions between the constituents of each bioactive material. It becomes evident that a relationship exists between the structural characteristics of the phenylpropenes and the antifungal activity. The presence of two methoxyl groups in positions 2, 3 of the benzene ring of apiol led to a notorious increase of the antifungal activity when is compared to safrole. These results indicate that lipophilicity and/or electronic and steric factors on phenylpropenes might be important for the antifungal activity. Although not much is known about the mechanism of antifungal action of phenylpropenes, it has been reported that their lipophilic character enables them to alter the fluidity and permeability of cell membranes (Devi et al., 2010). In addition, these compounds inhibit specific cellular processes or enzymes (Wendakoon and Sakaguchi, 1993). Thus, the two methoxyl groups (a bulky electron-donating group) on apiol may lead to a correct balance of hydrophilicity-lipophilicity, which is a determinant factor for the antifungal effect in this compound. On the other hand, evidence of electronic and steric factors in the fungitoxic mechanism of organic compounds has been previously reported (Gershon et al., 2004). According to the results, EO/FE from P. holtonii and apiol were selected as the most promising materials. Their toxicity on fruit peel and antifungal activity in whole fruits were evaluated. 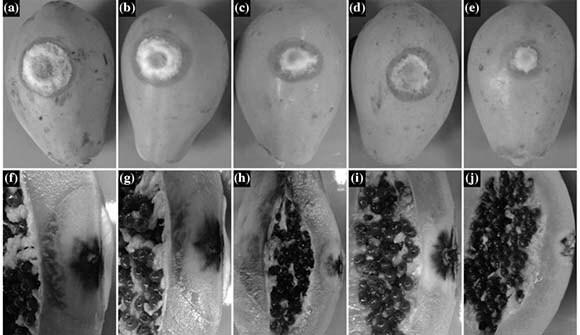 In order to study the in vivo effectiveness of materials as fungistatic agents, papaya fruits inoculated on a wound with C. gloeosporioides were treated with the more promising materials according to in vitro assay: FE, EO from P. holtonii and apiol, at 2%. There was 11, 47, and 54% reduction of the lesion diameter on treatments with FE, EO, and apiol, respectively, when compared to controls (untreated fruits or fruits treated only with lecithin). Compact white mycelial mass surrounded by small water-soaked spots were present over the lesions on the surface of fruits (Figure 4). Internal tissue in the infected area showed a grayish white discoloration which was deeper in both controls. The progress of the lesion into the parenchyma of the fruit was lower in the treatment with apiol followed by EO and FE. Figure 4. In vivo antifungal activity of essential oil (EO), n-hexane extract (HE), and apiol from Piper holtonii at 2% in papaya cv. Hawaiian, 7 d post-inoculation with Colletotrichum gloeosporioides. (a) and (f) are the untreated control; (b) and (g) are controls treated with 2.5% lecithin; (c) and (h) are fruits treated with EO; (d) and (i) are fruits treated with HE; and (e) and (j) are fruits treated with apiol. Despite relatively good antifungal activity of the EO/ HE and apiol, and low phytotoxicity on the fruit peel, it is necessary further studies on the persistence and toxic effects in order to develop new antifungal agents for the control of these fungi. The antifungal activity of EOs and hexane, dichloromethane, ethyl acetate, and methanol extracts obtained from Piper auritum and P. holtonii revealed that only the hexanic extracts and EOs showed a relatively good antifungal activity against C. acutatum, C. gloeosporioides, and B. theobromae. In addition, oil and extract from P. holtonii were more active than those from P. auritum. Furthermore, the antifungal activity observed for the hexanic extract and EO suggests that the active metabolites of both Piper species are mostly lypophilic compounds. Active oils/extracts were found to be rich in phenylpropenes being safrole and apiol the major compounds from P. auritum and P. holtonii, respectively. Apiol can effectively inhibit the mycelial growth of the evaluated pathogenic fungi. In addition, the application of active oils/extracts and their major constituents on the peel of avocado and tamarillo fruits show no apparent damages, or odor or taste changes. So, EOs and hexanic extracts or their major compounds could become a natural and effective alternative to synthetic fungicides for using in the treatment of plant pathogens and develop of novel types of selective and natural fungicides. This work was supported by a grant (Vicerrectoría de Investigation, N° 20101007957) from the Universidad Nacional de Colombia. We thank Dr. Callejas (Universidad de Antioquia) for helping in the botanic identification of both species. We also thank to Dr. Afanador-Kafuri (Laboratory of Phytopathology, Universidad Nacional de Colombia) for providing cultures of plant pathogen fungi. Castañeta, M.L., A. Munoz, J.R. Martinez, y E. Stashenko. 2007. Estudio de la composición química y la actividad biológica de los aceites esenciales de diez plantas aromáticas colombianas. Scientia et Technica XIII:165-166. Gupta, M.P., T.D. Arias, N.F. Williams, R. Bos, and D.F.E. Tattje. 1985. Safrole, the main component of the essential oil from Piper auritum of Panama. Journal of Natural Products 48:330-330. Sánchez-Suárez, J., D. Albarracin, M. Rojas, J. Rincón, S. Robledo, D.L. Munoz, et al. 2010. Evaluación de la actividad citotóxica y leishmanicida de extractos y fracciones de Piper cumanense y Piper holtonii. Revista Colombiana de Ciencias Quimico-Farmacéuticas 39:21-29.